When visiting the Connecticut coast, there are few activities more enticing than exploring the beautiful shoreline. That’s why Mystic cruises are the perfect day trip for your getaway! Sail on the ocean and discover Mystic like never before in an enchanting and original way. Travel back in time on historic whalers, feel the salty water in your hair and breathe in the heritage of the Connecticut air. Whether you’re more of a relaxing-on-the-beach type of traveler or are looking for some adventure, these Mystic cruises are sure to win you over! If you like Mystic Cruises and want to discover more activities around Stonecroft Country Inn, make sure to download our Free Vacation Guide! You’ll get our local recommendations for top outdoor adventures, gourmet restaurants, quaint shops, fun museums, and more! You have many options when it comes to getting out on the water. From historical rides to river cruises, you can pick and choose which atmosphere you prefer for your great Mystic River adventure. Whether you’re looking for a relaxing ride or want to learn a few things about hoisting sails, these four amazing Mystic Cruises will make your day activity a unique experience! Argia Mystic Cruises – Argia Cruises offers day sails and sunset cruises aboard the historic 81-foot Schooner Argia ship. Travel back in time and experience life at sea on a Two-Masted Gaff Topsail Schooner from the 19th century. The Argia is available for public cruises from May through mid-October and can also be chartered for private events like weddings or corporate parties. Mystic Whaler Cruises – Whaler cruises bring passengers on an authentic journey out to the sea. If one day is not enough, embark on a three to five-day expedition up and down the East Coast. Discover your inner sailor as you stand on deck with nothing ahead of you but the ocean. Feel the wind and the waves hit the ship’s hull as you help raise the sail. The sun will feel warm and comforting as you are reading a good book on the deck or jumping in the water with your friends and family. This all-inclusive cruise is a wonderful adventure you will never forget. The Mystic River Cruises: Mystic River Cruises is the most romantic and low-key option. Admire the purple colors of the sunset as you move smoothly along the river on a 1947 classic wooden motorboat. Go on a lunch cruise with a delicious bakery-style breakfast picnic or simply enjoy a warm cup of tea while wrapped up in a cozy blanket. You’ll discover a breathtaking landscape and have a magical time with your loved ones. Poet’s Lounge Sailing Charters: “Oh what pleasant visions haunt me as I gaze upon the sea!” Henry Wadsworth Longfellow’s verses come alive when you sail aboard the Poet’s Lounge ship. This 39-foot sloop was built in 1972 and welcomes up to six passengers. Set sail to the beautiful islands surrounding Mystic and enjoy their scenic beaches, or go for a swim and have a picnic! Cruises run May through Octobers and you can choose from two hours day trips or full day sails. Delight in the view of the mysterious ocean in front of you and get lost in its immensity! 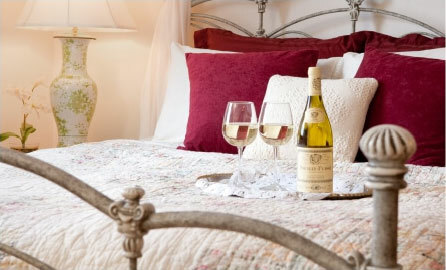 After a magical day spent on the sea, come back to an authentic New England room at Stonecroft Country Inn. 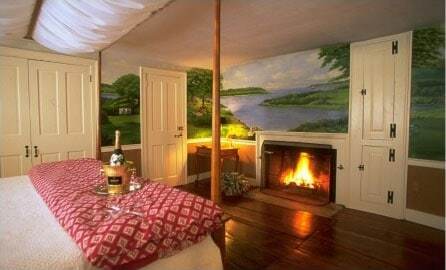 Our comfortable accommodations are perfect for a relaxing getaway in the tradition of Mystic’s historical heritage. Book our Orchard Room and enjoy the luxurious king bed and private ensuite bathroom. You can even cozy up by the fireplace with our special bottle of prosecco and chocolate covered strawberries and start the next day with our delicious homemade breakfast. Plan your stay today and prepare for one of the most exciting adventures of your life at Stonecroft Country Inn!